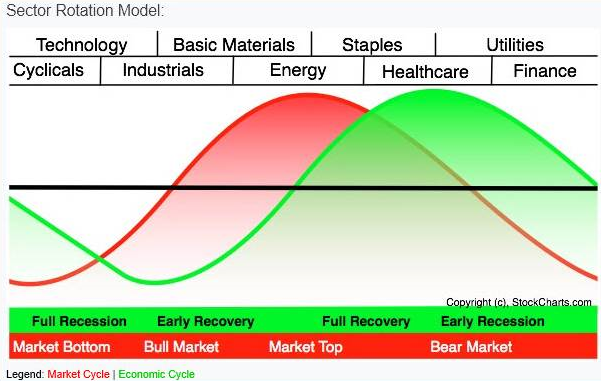 Sector rotation is a method of examining stock markets that goes beyond traditional technical analysis. In essence, it involves looking at what types of stocks are performing well to help predict how the stock market as a whole will perform moving forward. 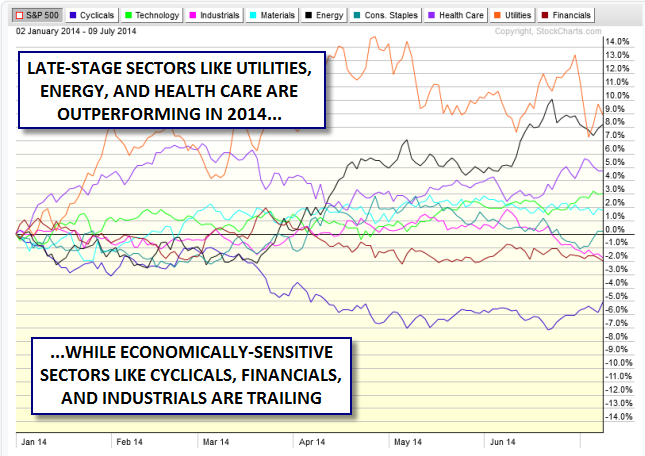 Historically, economically-sensitive sectors like consumer cyclicals and industrial stocks tend to outperform the stock market in a healthy uptrend, while economically-insensitive sectors like utilities and health care stocks typically outperform when the market is at risk of a pullback. Sector rotation “works” because most money managers must maintain a full allocation to stocks, regardless of their outlook for future performance. Therefore, the best way for them to mitigate losses in a bear market is to move funds out of high-flying speculative equities and into more conservative, stodgy stocks.